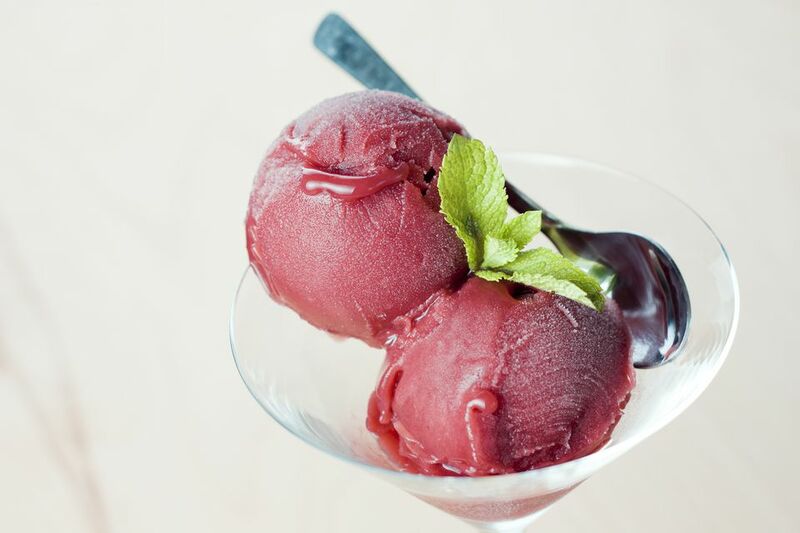 This garden-fresh strawberry basil sorbet provides a delicious twist on classic, sweet strawberry sorbet. It’s equally welcome as a warm afternoon refreshment or a shocking palate cleanser in the dead of winter. To ensure a fresh from the berry patch flavor, make sure to use fresh berries for this recipes, as frozen strawberries are often lacking in flavor. In a small saucepan, bring the sugar and water to a boil. Reduce the heat and simmer, uncovered, for about 5 minutes, until the mixture reduces in volume and thickens. Add the basil to the syrup and chill the syrup for at least 30 minutes, until it is slightly cool. Pour the basil-infused syrup through a fine-mesh sieve, discarding the basil. Process the infused syrup, strained strawberries, lemon juice, and vodka (or berry wine) in a blender until the mixture is smooth. Freeze the strawberry basil puree in an ice cream maker according to the manufacturer’s instructions and garnish the finished product with a fresh basil leaf, if desired. A trio of sorbets: strawberry basil, lemon, and chocolate. Serve a scoop in a tuile cup.